Google+ may not be Facebook, Twitter or LinkedIN, but it has some qualities that as a marketer, you can't ignore. Depending on your industry and buyer personas, Google+ may be the best place to generate new leads or the worst place! Either way, you need to be present. These 3 simple tips will get you off to a good start with Google+ for your business. We recommend this for any social network that you think your business should be involved with. By engaging with Google+ on a personal level, you will get to know how brands and people interact on the network and what all of the options are. Google+ is NOT used the same way Facebook is used. It's not used the same way LinkedIN is used. 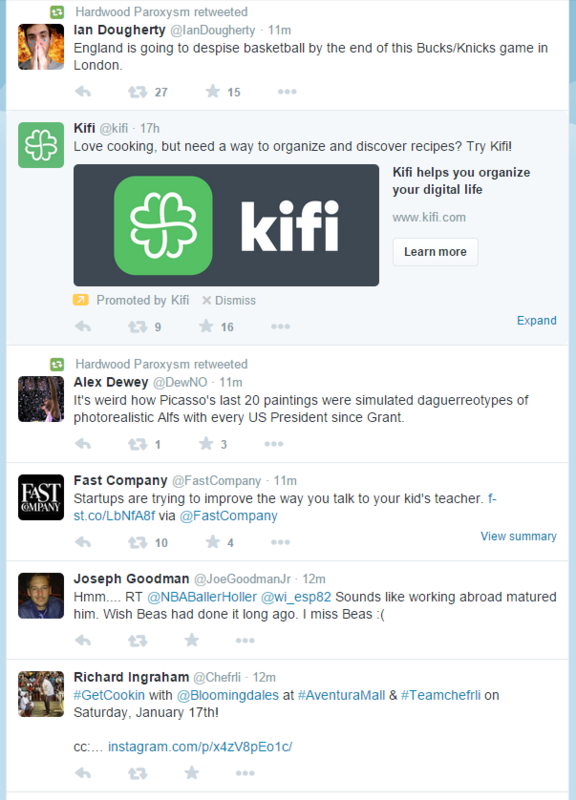 It's probably closest to Twitter, but much more visual and verbose. Because it's VERY common for your Facebook or Twitter friends to not be on Google+, don't focus on adding personal friends to your circles. If your friends all happen to be on Google+, by all means add them. But, don't be surprised if they aren't! So how do you get started personally? Start by by looking for topics you are interested in and circling users, pages or communities that post about your interest. For example, I am personally into car detailing. I love it when my car is clean both inside and out! AS a byproduct, I also love cars in general! Therefore, I have a Google+ circle called "Detailing" where I've added many of the detailing product brands that I like, large detailing companies from all over the world, and users that are enthusiasts like myself. I am also interested in watches. I don't own a nice watch, but would love to someday. I have found tons and tons of users, businesses and communities that share pictures and information about watches and so I've created a Google+ circle called "Watches". You may want to create circles for US News, Stocks, Marketing, Manufacturing, etc... The idea at this stage is to add things you are PERSONALLY interested in and consume the great posts shared on those topics. Over time you will get a really good feel for how Google+ is used. We all know that search engine optimization is not an option, it's a must. Anything you can do to improve your SEO in a non-black hat way, you should do. For starters, as a small business, you must combine your Google+ Local Page with your Google+ Business page. This will help tremendously when a searcher is using location limiters while looking for a product or service you offer. It also tells Google much more about your business, making it easier for them to rank you higher. Google also shows Google+ posts directly in search results! No Google+ posts = no chance of that happening for your business. Why would you not take advantage of that? You can't tell from this screen shot, but the Matrix image on the left was animated as was the infographic on the right. These 2 posts really stood out in my feed of posts. If we look at the middle post, you see that Mercedes-AMG shared a photo gallery of really nice pictures. Google+ does photos REALLY well. 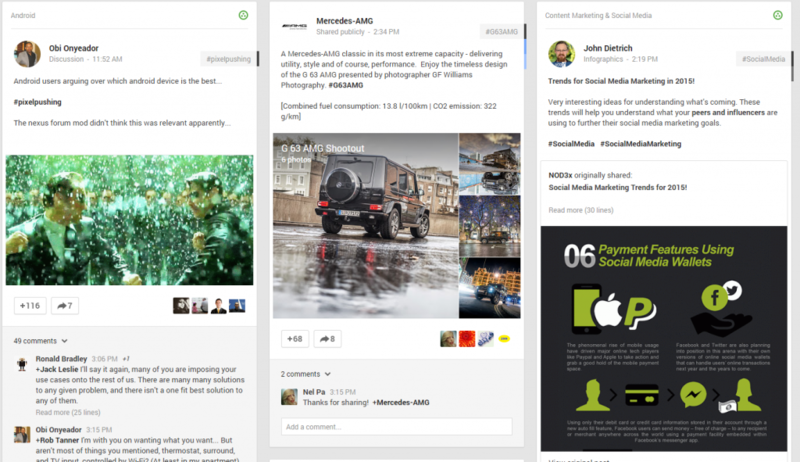 You can also see some examples of hash tags and text formatting in the 3 Google+ posts above. It makes content more readable and gives the ability to stand out a bit. Twitter is getting much better at showing more visual posts, but you are still limited to 140 characters and no formatting of the text. You may never replace Facebook at a personal level, but I'm certain that there is more to gain for many businesses by being active on Google+. To get started right, start using Google+ personally to follow topics you're interested in. Once you start using Google+ for your business, remember to stand out from the crowd and take advantage of the SEO impact you can make.